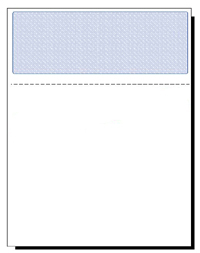 High security blank check on top with CopyBan Capture® patented background with a hidden void. Blank laser check on the bottom with one long top voucher. Features a CopyBan Capture® patented background with a hidden VOID. We carry a full selection of MICR toner cartridges. High security blank laser check on top with CopyBan Capture® patented background with hidden VOID. Two vouchers for printing check details. Perforated at 3 1/2" and 7".